At Odell Johnson Performing Arts Center. 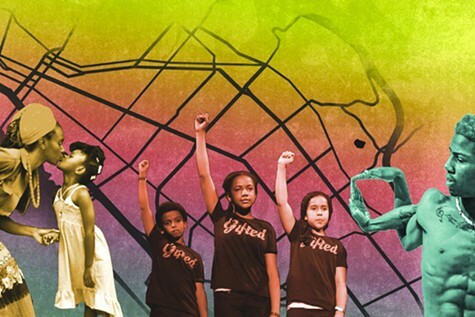 Collage by Cal Tabuena-Frolli for KALW featuring Young Gifted and Black (L) and a member of Turf Feinz. “What does East Oakland look and sound like through the eyes and ears of its artists?” That’s the question at the core of Sights and Sounds of East Oakland, an upcoming free event put on by KALW. The afternoon of performances, which will take place at Odell Johnson Performing Arts Center at Laney College (900 Fallon St., Oakland) on Sunday, April 17 at 3 p.m., will feature live storytelling by Oakland Voices’ citizen journalists, plus musical and dance performances by youth performers Young Gifted and Black, the famous turfing crew Turf Feinz, Danza Azteca performer Calpulli Coatlicue, and the eight-piece Afro-Colombian dance music band La Misa Negra. The audience will hear from Brittani Sensabaugh, an East Oakland native who has traveled the country documenting Black communities and listening to stories from residents therein. The event will also feature visual art from Ajuan Muance, who makes comics about Black life in America, and Chamuco Coretez, a Chicano tattoo artist from East Oakland.